Sunday after church, if all goes as planned, and if the moon is in the Seventh House, and Jupiter aligns with Mars, I do a menu plan for the week. In other words, sometimes I don’t do a menu plan for the week. But, I try. Planning meals for the week makes life so much easier: greatly reduced amount of time spent staring into the fridge wondering what to serve, and greatly reduced stress levels during one of the more frustrating parts of the daily grind; the two hours between getting home from school (snack, homework, etc), and actually getting dinner on the table. When I have it all planned out, I can get a lot of the prep work done ahead, not stress over which veggie to serve, and (added bonus), I actually cook less – can you give me a woot woot for leftovers, and I have a lot less organic food waste. This week was one of those great weeks when all the necessary interplanetary alignment occurred without interruption and I was able to sit down for a while with my old-fashioned recipe box, my computer, and the latest issue of Cooking Light. This recipe is so simple and there’s very little to do once the brisket is browned and in the oven. With that said, though, it’s not a slow-cooker recipe, so you can’t walk off and leave it cooking unattended, either. There are a total of three turns of the meat, and the veggies go in during the last hour. Serve immediately over the carb of your choice. I plated it with wide egg noodles for a very hearty, seasonal autumn dinner. Enjoy! Kitchen Notes: My brisket was just over two pounds as compared to a slightly larger brisket used in the original recipe. Even reducing the baking time accordingly, my brisket was so tender it practically shredded when I sliced it. This is quite a departure from the photo in the magazine which clearly shows a very neatly, evenly sliced piece of beef. Although the meat was delicious, if I’d been looking for a perfect and pretty slice of cooked meat, I’d have been disappointed. On the other hand, the leftover meat made for a really nice improvised pulled beef sandwich. Adjust your baking time accordingly. Also, the gravy is very intensely flavorful. Use it! 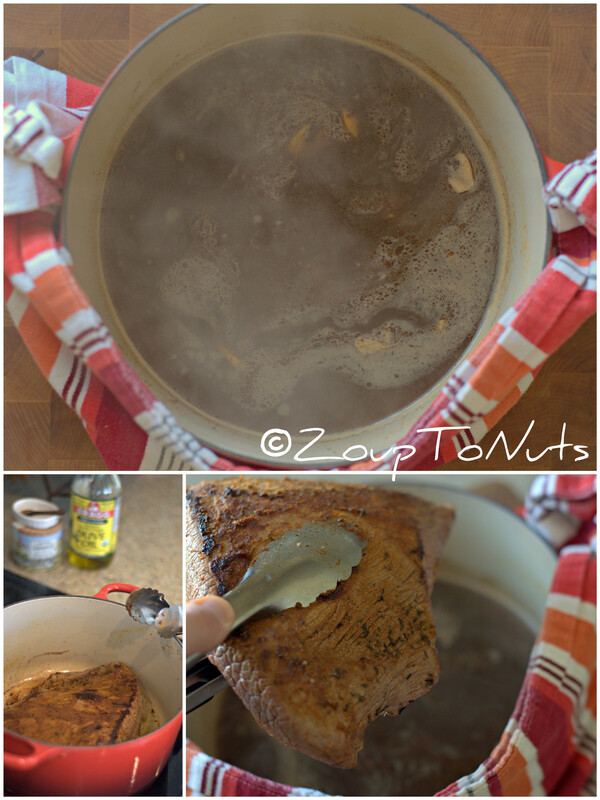 Combine first 3 ingredients in a small bowl; stir in 1 teaspoon salt. 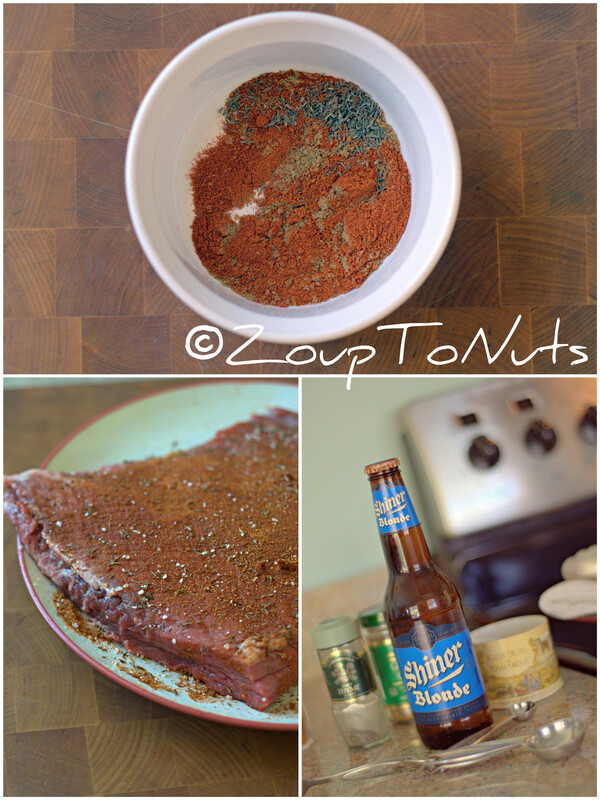 Rub spice mixture evenly over both sides of brisket. Heat a Dutch oven over medium-high heat. Add oil to pan; swirl to coat. Add brisket; sauté 3 minutes on each side or until browned. Remove brisket from pan. Add beer; bring to a boil, scraping pan to loosen browned bits. Add broth and garlic; return to a boil. Return brisket to pan. Cover and cook at 325° for 2 hours. Turn brisket over; cook an additional 2 hours. Turn brisket over. 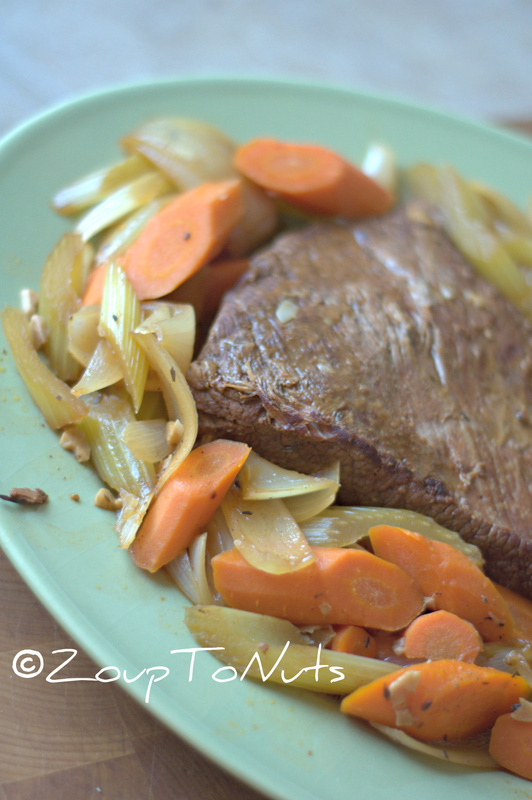 Add carrot, celery, and onion; cook an additional 1 hour or until brisket is very tender. Remove brisket and vegetables from pan using a slotted spoon. Skim fat from cooking liquid; discard fat. Bring cooking liquid to a boil over medium-high heat. Place flour in a small bowl; stir in 1/2 cup water. Add flour mixture to pan, stirring until smooth; bring to a boil, stirring constantly. Cook 2 minutes or until slightly thickened. Stir in remaining 1/4 teaspoon salt. Serve the sauce with beef and vegetables.